These are great for occasions (valentines day etc). The icing part was difficult for me as I hadn't worked with icing before. It has a remarkably dense texture, which requires watering down with hot water - but not too much - just enough to make squeezing it easier. It takes quite a while for the icing to dry (depending on the humidity it can either be 3 hours or up to overnight) so it is best to prepare these in advance. 1. Using a stand mixer with a paddle attachment cream the butter until fluffy. 2. Add the sugar in three separate additions – beating at low speed for 2 min after each addition (make sure that you use a rubber spatula to scrape the walls and bottom of the bowl before each addition to ensure the butter is uniformly integrated). 3. Add the egg yolk and vanilla extract and mix until well combined. 4. Whisk together the flour and salt and add to the butter mixture using low speed, until just combined. 5. Scrape the dough onto a work surface and divide into 4 part. Make these into flat discs and wrap them in plastic wrap and refrigerate for at least 2 hours. 6. After at least 2 hours of refrigeration, preheat the oven to 350F. Lightly grease two baking sheets. 7. Remove the dough from the fridge and let stand at room temp for 15 min. 8. Working with one disc at a time roll the discs between two pieces of plastic wrap until 1/8-1/4 (3-6mm) thick. 9. 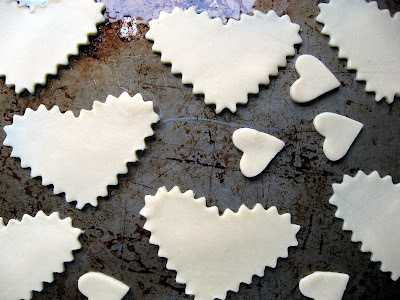 Cut shapes out of the dough and place on the prepared baking sheets. Repeat with all four discs of dough. 10. You can re-roll the scraps once before the biscuits loose their texture. So if you have left over dough after the second rolling, throw them out. If you have detailed cuttings (like the ones I used which had jagged edges) refrigerate for 15-20 min before putting in the oven. 11. Bake for 10-12 min until they are lightly golden on the bottom. 12. Let cool for around 10 min on the baking sheet and then using a metal spatula place on a wire rack to cool completely. 1. Using stand mixer with very clean bowl place the egg whites cream of tartar and beat on medium speed using a whisk attachment until frothy. 2. Reduce the speed to low and slowly add the icing sugar until blended. 3. Beat on high until thick and glossy. 4. Add food coloring if desired. 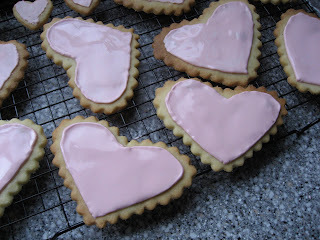 1.Using a pastry bag with a thin tip attached to it (I used a 4 which was pretty big) place some royal icing in the bag. Make sure to cover the icing very tightly with plastic wrap as it dries out very quickly. 2. Try and squeeze a line around the edges of the shape you desire, if it is really hard to do this remove the icing from the bag and place it in a small bowl. Add a little bit of hot water and mix well until you think you have reached a consistency which would make it easier to ice. 3. Once the outline has been complete, draw lines close together inside the shape using the same icing color. 4. With a pastry brush merge the lines. If you require more icing simply put more one. 5. If you want to add other colors as a layer effect – wait at least three hours until you add the additional color. Taken from Williams-Sonoma "Cookies" pp. 14-5 and 99.